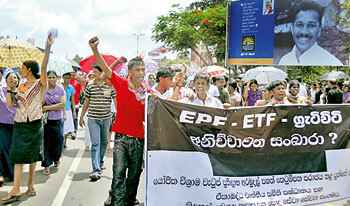 The needless death of 22 year old Free Trade Zone worker Roshen Chanaka when police opened fire during a demonstration in Katunayake, has jolted the conscience of the nation. Angry reactions have erupted at street level not only among the young man’s co-workers in the FTZ but across the board in demonstrations by numerous trade unions, political parties, university students and sections of the clergy. It would be disingenuous on the part of the government to seek to portray this unrest as having been ‘set up’ by its political opposition in order to exploit a volatile situation. There is a palpable sense of outrage in this public outcry that none can deny. The scale of the protests in recent weeks indicated the degree of unpopularity of the ill-conceived Private Sector Pension Bill, now shelved. Many would have watched the television coverage of the confrontation between police and affected FTZ workers that took place in Katunayake on Monday. It was virtually a pitched battle between unarmed protesters and cops who, though they did not carry guns, had the advantage of tear gas and batons. Some protesters were seen viciously attacked even after they had fallen to the ground or had been apprehended. Different media reports mentioned numbers between 39 and 250 as having been hospitalized with injuries, along with a much lower number of policemen. While it is not clear how the police ended up using live ammunition on the unarmed protesters, what does become clear in this incident is just how helpless the citizenry are in any confrontation with law enforcement authorities. This episode has drawn intense media attention partly because the victim belongs to a large body of organised workers representing an important sector of the economy. Besides, the incident took place in the context of a highly charged issue relating to workers’ rights. But there are countless other incidents of police using firearms and shooting to kill in questionable circumstances that pass without comment, because the victims are deemed to be of no importance. They are simply referred to as ‘suspects’ in a crime, or reported as having ‘attempted to flee’ the scene of a crime, or having ‘tried to escape’ from custody. The public seldom find out whether these hapless persons were guilty of any wrongdoing, or were in fact totally innocent. They are generally from poorer social strata that have less ability to voice their grievances. In times of peace citizens would expect live ammunition to be used by the police only as a last resort, and that too in a situation fraught with extreme danger. Of what use is their training if they don’t know how to overpower an individual, if it becomes necessary, without using lethal force? In a previous comment on the subject of police brutality this column asked if police personnel were too trigger happy. In the wake of the FTZ incident, it bears repeating to say that “People need to know what rules or guidelines the police in this country are expected to observe when it comes to using force, especially lethal weapons. The Prevention of Terrorism Act that gives wide powers to the police and armed forces and emergency regulations still remain despite the end of LTTE terrorism. Is their continued existence likely to help in eliminating police brutality?” (Sunday Times, 01.08.10). While the IGP’s resignation soon after this incident is commendable, there is no certainty that it will ease the current tensions. The move was announced as an ‘early retirement’ although it was linked to the FTZ episode in a show of accountability. The mood of cynicism that prevails is reflected in an SMS comment carried in an English daily that said “Don’t worry … very soon you will be a Diplomat.” Such is the level of disillusionment with our public institutions and the political meddling that bedevils them. Among the demonstrations against this incident was one organised by the opposition JVP at Lipton Circus in Colombo on Thursday. Reporters from several media channels said they saw a group of persons armed with sticks and iron rods in the vicinity, led by a government MP apparently preparing to disrupt it. The move was reportedly prevented by police. There have been occasions in the not-so-distant past where police did nothing to stop similar groups of pro-government thugs who arrived on the scene of opposition protests in order to disrupt them. It happened during a mass demonstration in support of (retd.) Gen. Sarath Fonseka at Hulftsdorp Hill and during an opposition UNP protest at Borella on Independence Day. In those instances the police stood by as violence was unleashed by the rock-throwing goons who seemed to materialise out of thin air. The police were reprimanded by the Colombo Fort Magistrate for their failure to apprehend the culprits on Hulftsdorp Hill in spite of video footage that should have made the task easy. The apparent complicity of ruling party politicians in violence directed against their political opponents is no more reassuring to the public than the police inaction during these incidents. It matters little to the general populace that some elements may be acting of their own volition, without the endorsement of the party. In the end it is the party hierarchy that must take responsibility and it is the government’s image that takes a beating. With the disaffection of the workers and trade unions over the infamous Pension Bill and now, the death of Roshen Chanaka who was merely exercising his democratic right to protest, the President’s credentials as an advocate of labour rights have been sullied.